For every Christmas of my life I have spent Christmas Day at my parent's place. Even after I got together with Kelly and then married, we still spent the day there as her family, being Euopean, celebrate Christmas on Christmas Eve. The intention was to start the real trip from the Gold Coast on Christmas Day. For once, fate did not intervene in our plans. We left home at 6:10 am in light rain. We headed north across Sydney and then up the F3. The rain was fairly light, although there were some heavier falls. So far the trip is starting off as normal (that is, it is raining). We stop at the 12 Mile Rest Area north of Raymond Terrace (near the Bucketts Way turn off from the Pacific Highway) at 8:45 am. Here we have a cup of tea and also let our dog Veto have a wee stop. Veto is coming along for the trip up but will be travelling back to Sydney with Kelly's Dad, Tomas. We are back on the road at 9:05 am and at just after 11 am we arrive at my Uncle Bill's holiday place at Camden Head near Dunbogan. This is a bit off the highway but we decide to drop in to say hello as we have not seen Bill and Pam since shortly after Dad died in July 2010. After a spot of lunch, we leave at noon. The rain has now stopped and it is sunny. Things are looking better, although we get an SMS from Ron and Donna (who are at Byron Bay) asking if we are bringing the rain with us! 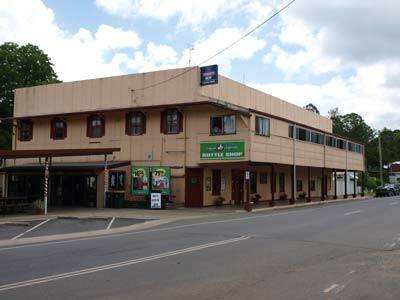 We pass through Kempsey without too much trouble but heading south, the traffic is banked all the way from the bridge over the Macleay River for almost six kilometres to Frederickton. Why? Because the Roads and Maritime Services (RMS - ex RTA) has not thought to change the phasing of the traffic lights through the main part of Kempsey. 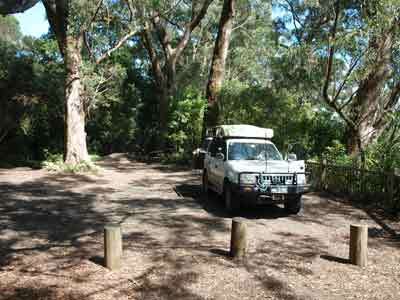 At 1:40 pm we come to the Scotts Head turn-off from the Pacific Highway and also to a stop. The traffic is banked up from here to Macksville, a distance of about four kilometres. Once we get into town we see the problem. There are two sets of traffic lights just before the bridge. As stupid as it seems, the RMS have the first set of lights going green but the next set is red. When that set turns green, the first set goes red. Therefore, only a few cars can get through at a time and even then, they only get through in two goes. I never fail to think how stupid the traffic light engineers and traffic controllers are in NSW. We finally get through Macksville after taking 20 minutes to travel the four kilometres. All morning we have been hearing on the radio about a truck accident north of Coffs Harbour that has partially closed the road. The reports state that a leakage of carbon dioxide from a cylinder is causing problems. This is hard to understand as the only time this would be a great problem would be if it was a huge tanker-size cylinder and it was liquid carbon dioxide. As we approach Halfway Creek where the accident happened, we find only a slight slowing down of the traffic. We come to the accident side and see that a B-double has speared off the left side of the road and ended up totally in the bush. It was heading south and has crossed over to the wrong side of the road and gone into the trees. Funny, the truck is carrying beer as there is a huge amount stacked on the side of the road and more still in the truck. Where did the reports of the carbon dioxide come from? We have a good run from here and despite a quick stop at the Halfway Creek Rest Area, we arrive at our friends Shaun and Sharon's place at Lennox Head at 5:45 pm. 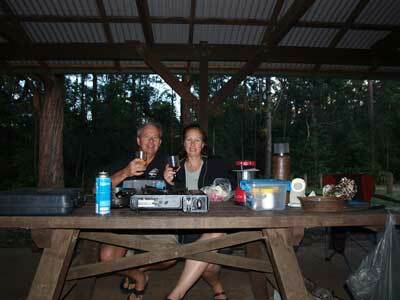 Ron and Donna (dive buddies and camping cohorts), who are staying at Byron Bay for the week, come down and we have a great barbecue dinner. It is great to catch up with Shaun and Sharon who moved here from Sydney just over a year ago. We are up at 7:00 am as we want to get going early. A quick breakfast and we are off again. We leave at 8:40 am and it is already 26ºC. We have a good run north and at Nerang in Queensland we stop to refuel. We take 131.9 litres, giving an average of 14.3 litres per 100 kilometres. A bit high but not too bad considering we have been sitting on 100 km/h for virtually the whole way, about 10 km/h more than we normally drive at on trips. We arrive at Kelly's Mum's place at Surfers Paradise at 9:15 am Queensland time. We spend the rest of the day talking and doing some food and drink shopping for Christmas Dinner. I also have to make a minor repair to our setup. Before I left Sydney, I purchased some new clear plastic hose to replace the hose that runs from the water tank to the rear of the car. The stuff that I put in in 1999 when I built the storage system had started to grow green stuff inside. Not the healthiest thing I suspect. However, the hose is giving a plastic taste to the water as it comes out. Tomas (Kelly's Dad) and I head to Bunnings where I purchase some more, but I suspect that it is the same product that I purchased in Sydney. The only other product that specifically says it is food grade is some blue garden hose in 20 metre lengths. Sure enough, when we get home I run some water through it and it is tainted. Looks like I will need to do some more on this tomorrow. Later Kelly's sister, Nicole, arrives. As mentioned, I have to try and find some new food grade hose. I take the stuff I purchased yesterday back to Bunnings and then try a few places. First off a 4WD shop, no, an auto shop, no, Clarks Rubber no (even though its web site says it does stock this item). Mary has told me that there are some camping shops nearby so I head there. I see a shop that sells pool cleaning products as well as rubber products. I go in there and find that they have non-toxic hose. I need about 13 mm and I see they have 12.5 mm hose. The young kid cuts me two metres. I take it back and when I go to use it I see that it is only 10 mm. Bugger, what happened here. I head back to the shop but find they have no 12.5 mm hose, only the bit the kid showed me. Well, I will have to see if I can make this work. Back at Mary's place, I put the hose in boiling water. When heated, and soft, I find I can push the hose over the connectors. This looks like it will work and the hose does not have a plastic taste. That night, we have a great Czech feast, far too much food for us all. We get up latish as we had a big night. We take our time repacking the car and eventually we are ready. We say good-bye to Tomas, Mary and Nicole and, of course, Veto. We will miss her over the next week we know. We leave at 11:15 am (Queensland time). 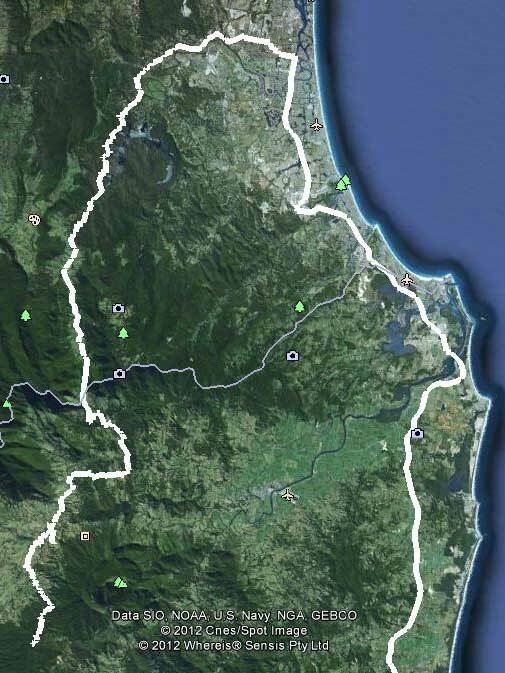 We decide to take the most direct route which heads into the Gold Coast hinterland before crossing into NSW north of Murwillumbah. 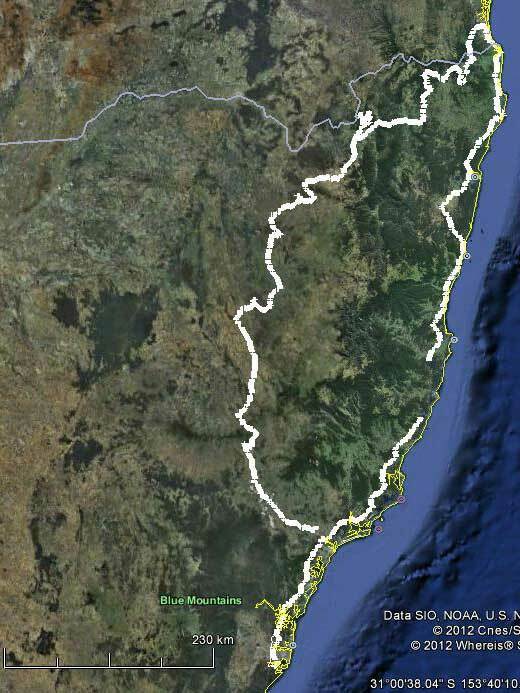 We cross into NSW at 1:00 pm (NSW time). At this location there are the remains of a border inspection post (for ticks and fruit fly I think). Now there is just a set of cameras to record photos of who comes through and a sort of lookout. We arrive at Tyalgum at 1:27 pm. This tiny town has an old hotel and a very old looking service station/mechanical repair place. We have lunch in the small park opposite the pub. We head off at 1:47 pm. Our plan is to take a road called Swifts Road which just to the east of the town. 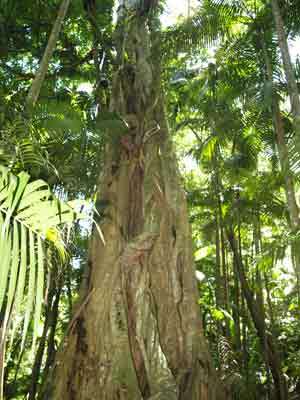 This leads to Brummies Road and around the back of Mount Warning. However, about 1.5 kilometres up the road there is a sign saying it is closed ahead. Plan B comes into play and we head back to Tyalgum and take Brays Creek Road. This becomes Byrill Creek Road and then Mebbin Forest Road. Along this road we stop and cut some timber for our fire tonight. We arrive at Cutters Camp Camping Area at 2:40 pm. This is a very large camping area located either side of the road. There is a shelter shed on the lower half which might have a gas barbecue. There are also some tables, timber barbecues on both sides and another large shed on the upper side. This one has a table inside as well as a fireplace. There is also another shed and toilets and water tanks. It costs $5 per person a night as well as $7 for the car. The camping area has a lot of nice grass but it is not real flat, especially the upper section. It is also not suited to roof-top tents or camper trailers except at the very top of the upper level. There is only one other car here and they are using the bottom shelter. We decide to camp at the top shelter, especially as it is looking like it may rain. We set up in the car park with our awning over the fence. We are having a roast for dinner so I get the timber out and we set up our chairs and some gear. We see that there is a sign to the creek to the north. It appears to be pointing back down the road so we walk there. However, there is no way that you can access the creek. We walk back to the camping area. Soon after a few maxi-taxis arrive as well as a couple of other cars. Turns out they are a few Indian families celebrating one of their daughters' birthdays. I lend them our small stove and a saucepan as they are looking for a power point to heat up their tea, not likely out here! In turn, they give us some Indian nibblies as well as some birthday cake. Another car with a family arrives for a late picnic and then a car with four backpackers. There is one French male and three females. I see a few small wallabies so I go and tell them in case they have never seen them before. I talk to one girl as we walk back and I am having trouble picking the accent. I ask where they are from and I am astonished to find that the girls are all from Estonia. I have never met anyone from Estonia and I am sure that there are very few Estonian tourists in Australia. For those who are not aware, Estonia is to the east of Sweden and was part of the USSR. They also tell me that the walk to the creek is actually down a track that was not visible unless you walked right up to the sign and it also was not worth doing. By this time I have started a fire as we are having a roast turkey dinner. The turkey is a rolled turkey breast with cranberry sauce. It is the perfect size to fit in the camp oven. The Indians leave and it is a lot quieter (their soccer game was, as can be expected, quite boisterous). I put the turkey on and it takes about one hour to cook. Kelly serves up the turkey with left-over potato salad and beetroot salad. A great meal! After, Kelly heats up a Christmas pudding and we have it with double cream. Yummy as well. 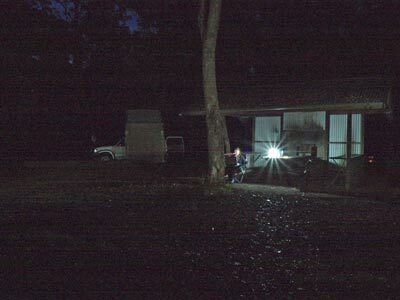 It is now very quiet as the backpackers went to bed at 8:00 pm. I go to have a pee and on the way back I feel as if I had some water on my ankle. Later I check and there is a leech attached. Kelly uses salt to remove it. The grass that I walked on was not more than 50 mm high! As usual on our trips we are reading books. I have another Lee Child Jack Reacher novel (very over the top but good reads) to read and Kelly has her new Kindle to start once she completes the book she is already reading. We read till about 10 pm and then go to bed. At 11:30 pm a car arrives and pulls up near us. They are not loud, but the light from their lantern is annoying. In what is the slowest erection of a camp site I have ever seen, it takes the male one and a quarter hours to put up one small tent. He then leaves the light on all night. During the night there are a couple of very small rain showers. It was quite warm overnight so we were very comfortable using just a sheet for most of the night. We get up at 7 am. I woke at 6 am and the people from the car next door are already up. I think that they must be heading off soon. However, once I am up I watch as the male puts up a tarp over the existing tent and then erects more small tents. I figure out that it is a male with his children. I make a joke to Kelly that they are breeding as when they arrived I first thought there was only one person with the male. Now I know there are at least two with him. Then I spot another and then another and then one more. He has five children. We guess that he is has collected the children from their mothers (we think more than one as they look quite different from each other) after Christmas lunch and then driven all the way here from somewhere like Sydney. The timing suits. We have breakfast and pack up, leaving at 8:35 am. It is now 20ºC and with still a high overcast. We head south towards the Kyogle Road. For this first section of the day, neither of our two GPSs are working, both are having trouble finding the satellites. They have been doing this occasionally for the past few days and a couple of days later we read in the paper that abnormal sun spots may cause problems for GPS units over the coming days. Sure looks like it will! We turn right at the Kyogle Road. Finally the GPS running OziExplorer starts working okay. We are looking for Creegans Road but when we come to the indicated turn the road is sign-posted swith some other name. 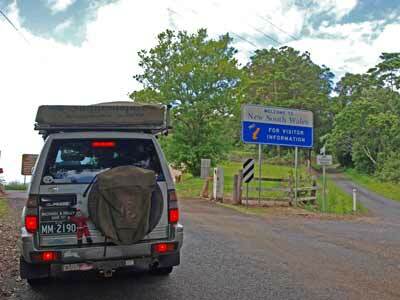 There is a sign pointing to Border Ranges National Park so we know that we have taken the right road despite the signs. A few kilometres on Creegans Road comes off to the right. We take this and start to climb. 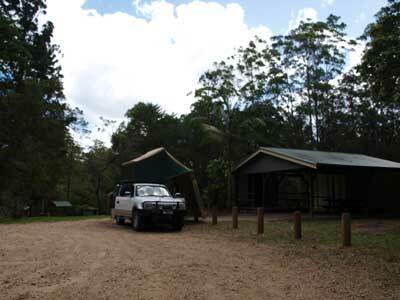 It is a very picturesque road, part of the Tweed Range Scenic Drive. 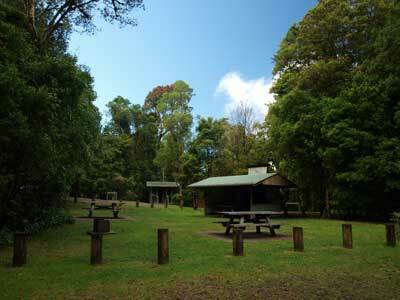 We soon enter Border Ranges National Park. The road is covered in a bit of fog as we ascend. At 9:47 am we arrive at Bar Mountain Rest Area. This is located at S28º 27' 32.9" E153º 07' 56.4" using WGS84 as the datum. It has toilets, a shelter and fire places. It is not stated to be a camping area, but there is no sign saying you cannot camp here. There is space for a few cars and would be a very nice place to camp. It is 1,125 metres here, well above the less than 200 metres of last night. As we head along the road there are lots of brush turkeys and wallabies seen. There are also plenty of common bronze wing pigeons. There are also lots of bellbirds heard. It is a lot cooler up here, only 16ºC. Three kilometres along the road we come to Blackbutts Lookout. This is located at S28º 26' 15.7" E153º 08' 37.1" using WGS84 as the datum. It is 9:55 am so we stop for morning tea. This has a couple of picnic tables, one with a roof, and toilets. Again, there is no sign saying you cannot camp here and there is space for a couple of cars. It is probably not suitable for normal tents. 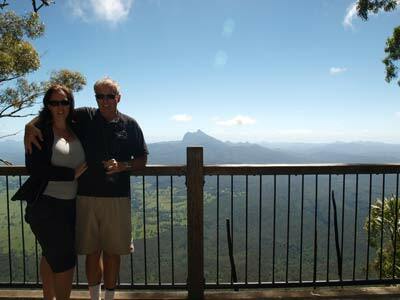 There are excellent views over the valley towards Mount Warning. While here we see some butterflies that we have never seen before. They are lime green/yellow, white and black. Very beautiful. We leave at 10:25 am and continue along the road. Another eight kilometres along there is another lookout. We see the sign saying it is coming up but we actually drive past it as we miss the actual sign showing where the walk starts. 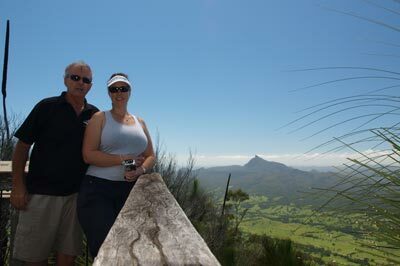 This is The Pinnacle Lookout and is located at S28º 24' 22.1" E153º 07' 39.8" using WGS84 as the datum. We back up and find that the track is a bit wider and this is obviously the parking area. We then see a sign which is only visible when coming from the opposite direction. It is now 10:40 am. It is only a 200 metre walk and is very easy. It takes 10 minutes to walk there and back. 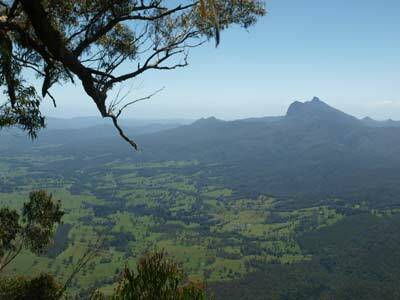 Again, this has great views over the valley and you can see back to the last lookout, Blackbutts Lookout. You also great to see the escarpment where the edge of the old volcanic crater ended. A few weeks later I see on the TV news that some bloke fell down here. No idea how you could do this. He was luckily heard by some people and the got help for him. We leave at 11:03 am. A few kilometres along we come to Brindle Creek Road. This is a loop that leads to some nice picnic areas and walks. However, it is closed. There is no explanation as to why it is closed and it looks like the sign has been there for a long time. We continue along the main road. 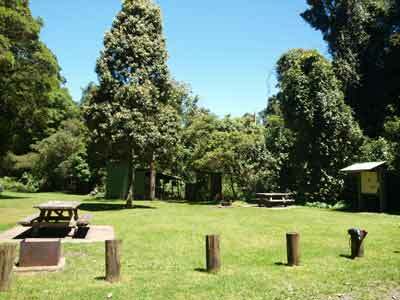 At 11:15 am we come to Forest Tops Camping Area which is located right on the side of the road. It is located at S28º 23' 15.5" E153º 03' 50.9" using WGS84 as the datum. This camping area is not very big, but has a nice grass area. 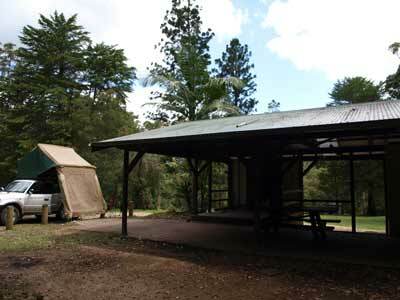 There are tables, timber barbecues, a shelter, water and a toilet. However, it is not suitable for roof-top tents or camper trailers as there is a fence between the road and the camping area. Nine kilometres further along is the turn-off to Sheepstation Creek Camping Area. 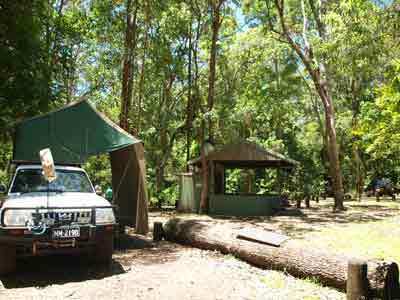 You actually have to go a very short distance outside the Border Ranges National Park and then come back in on another track to get to the camping area. 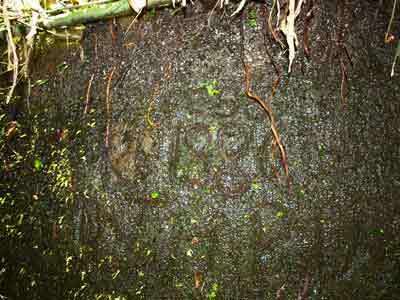 It is located at S28º 24' 48.0" E153º 01' 22.6" using WGS84 as the datum. This is a very nice camping area. It is only 11:30 am but this is as far as we are going to travel today. We drive around the loop road a couple of times and then pick out a spot right next to the large shelter. There are plenty of camp sites and many empty spots. There are a few day trippers having a barbecue, but it is a lot less crowded than I thought it would be. As well as the shelter, there are gas barbecues, timber barbecues, tables and toilets. We set up camp and read for a while before having lunch. 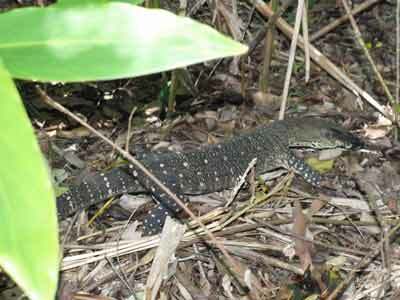 There are a few goannas in the camping area and the birdlife is also very good. After lunch we decide to walk to Brushbox Falls and the lookout. It is said to be a two kilometre return walk and take one hour. The falls appear to be on Sheepstation Creek (I assume). 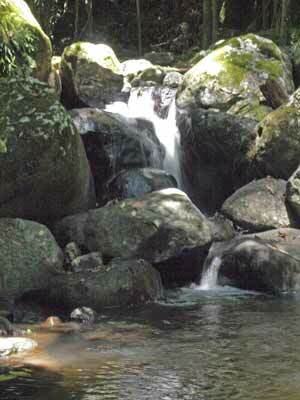 It is a nice walk and the creek has a good water flow. We head first to the lookout which is on the other side of the creek. 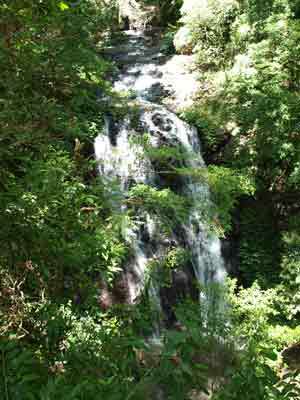 The falls are not huge, but there is a bit of water flowing over them. On the way back we decide to have a swim. We have carried our swimmers and towel with us. 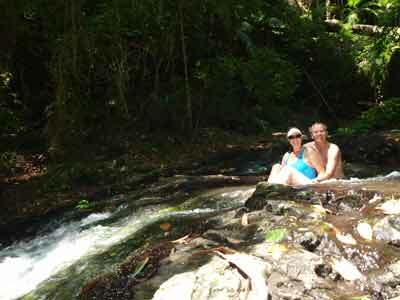 We find a spot just above the falls where there are some small pools (there are lots of kids in the pools further up the creek). It is cold! As we are at about 420 metres, and the water coming down the creek has come from as high as 900 metres, it is not unexpected. However, once you get in it is not too bad. We do not stay too long in the water but have a refreshing cleanse (saves setting up the shower tonight). We walk back to the camping area (it took one hour including the swim). I read again while Kelly decides to edit some videos from our November scuba diving trip to Chuuk Lagoon. A few more cars come in and camp and the day trippers leave. Funnily, there is a tent set up that has no-one with it at all. Wonder where they are? They do not return at all. Late in the afternoon it becomes cloudy and there is some light rain. It does not last too long, but luckily we have the shelter. We are having a barbecue tonight so decide to use the gas barbecues. These are located in a separate shelter only a few metres away. We have some sirloin steaks and sausages and salad. For dessert I have some more of the Christmas pudding. We read some more and go to bed at 9:30 pm. Unfortunately, being so far north and it a forested area, there is little chance of seeing any satellites and as it is cloudy tonight, we do not even bother to look.